Co-founded by Executive Producer, Nicole D. Ford, along with Master Drummer Papa Diarra Zumana and former Music Director, Angelo L. Stokes, Triba!, is a versatile collective of professional drummers, musicians, dancers, acrobats and entertainers who perform song, dance, drum and acrobatics from many sections and cultures of Africa. Headquartered in Las Vegas, Nevada, the ensemble includes musicians and entertainers from the United States, Ivory Coast, Gabon, Senegal, Kenya, Nigeria, Mali, Guinea, Zimbabwe as well as other countries throughout the diaspora. Members of the ensemble have performed at prominent and prestigious events including performing for and honoring leaders of countries, politicians, celebrities, business and community leaders while dedicating and volunteering their time sharing African culture through educational programs. Triba! is a flexible troupe that is able to conform to acts from 2 to over 50 performers. Their exceptional music direction and choreography coupled with business and corporate experience, gives them the ability to accommodate any specific event while sharing their love and appreciation of African and other world cultures. Executive Producer and Drummer: Nicole D. Ford holds a Bachelor of Science degree in Business Administration from the Haas School of Business at the University of California at Berkeley. Nicole has had an extensive career in corporate America working for and with well renowned companies such as Price Waterhouse, PricewaterhouseCoopers, Universal Pictures, Sony Pictures, Resources Global Professionals, and Diamond Resorts International. Nicole also served as Senior Vice President and Chief Financial Officer of Windswept Holdings LLC (formerly Windswept Pacific Entertainment) the world's #1 independent music publishing company headquartered in Beverly Hills, California and subsidiary of the #1 television network in Japan, Fuji Television Network. She was also responsible for managing the day to day finances and financial statement reporting for Hitco Music Publishing a joint venture with Antonio "L.A." Reid currently Chairman and CEO of Epic Records and formerly of LaFace/Arista Records, Island Def Jam and Simon Cowell's The X Factor (judge). In addition to being a percussionist/entertainer, for the last several years, Nicole has worked freelance jobs on the administrative, marketing and meeting-planning side of some of the world's largest and most prestigious conventions, corporate functions and private events such as MAGIC, National Association of Broadcasters (NAB), JCK, SEMA, Autodesk University, CISCO Live, Dreamforce, G2E Gaming Expo, IBM IOD Global Conference, CES, MRkt/Moda/Stitch Accessories Show, Licensing Expo, World Market, SHOT Show, Oracle Modern Marketing, etc. Papa Diarra Zumana is from the Bobo people of Burkina Faso and is a descendant of a long line of African Griots. Prior to moving to the United States,he was the principal djembe and balafon (African Xylophone) player in Ballet Djolem and Lakimado, world renowned Ivory Coast drum and dance companies. With both companies, he toured Europe, South America and West Africa and received many awards including the first rank of the competition of dances at the 3rd Francophonie Olympics in Madagascar, Le Prix de le Meilleure Troupe and Le Prix de Festival National de la Creativite. 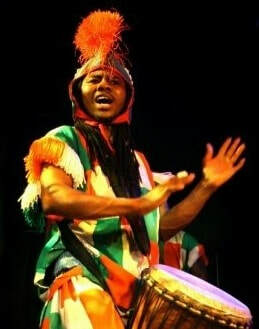 Since moving to the states in 1999,Papa has enjoyed teaching residencies with Columbia University and the Brooklyn Arts Council.He has also toured and performed with Sogbety and Vado Diomande, Feraba African Rhythm Tap Company, Fatien Ensemble, Hermano Vasquez Mexican Circus, Kotchegna Dance Company, and Gboze Drummers, to name a few. In addition, Papa spent 7 years performing at Disney World’s Animal Kingdom as well as Universal Orlando Citiwalk. Papa moved to Las Vegas, Nevada in 2014 and is currently performing at private parties and events,teaching, and composing music for a wide variety of African Drum and Dance Ensembles including Triba!